Copper wire butterflies add a touch of whimsy and color to your garden. Shape the copper wire into butterflies, then hang them from tree limbs, S hooks or attach them to garden stakes. Decorate the butterflies with dangling crystals, colorful beads and mirror tiles and you can use them to deter birds from your berry bushes. Trace the outline of a butterfly template onto one side of the wood block. 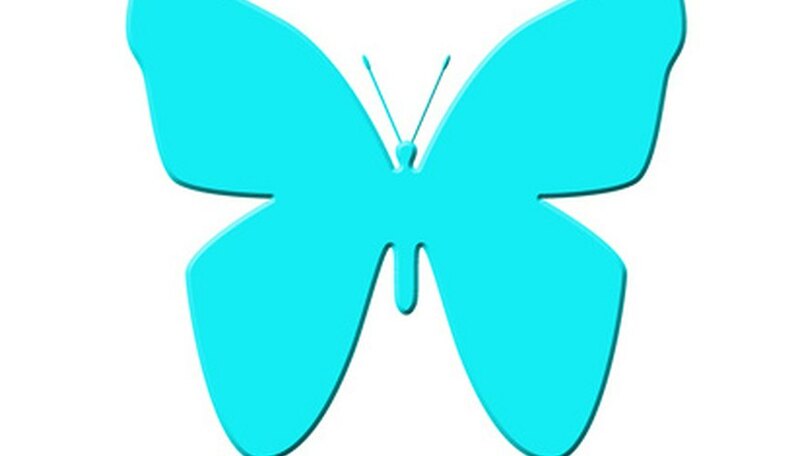 You can find butterfly templates in coloring books, craft stores and from online images. Hammer finishing nails along the outline on the wood block. Leave at least half of the nail exposed above the wood to create the jig frame. Space the nails between 1/3 and 1 inch apart around the outline of the design. Insert a nail wherever the butterfly shape dips or curves so the copper wire butterfly shape will be true to the desired image. Unroll a strip of 18-gauge copper wire. Do not cut the wire. Bend the end of the wire into a hook using round nose pliers. Slip the hook over one of the nails on the butterfly jig. The wire should fall on the outside of the jig nails. Wrap the wire around the outside perimeter of the nail jig, unrolling the wire from the spool as you go. When the wire completes the butterfly, unroll an extra 1 inch from the spool. Cut the wire from the spool. Make a hook in the end of the wire. Slide the butterfly shaped wire from the jig. Connect the end wire hooks by twisting them together. Cut two 6- to 12-inch-long strips of fishing line. Thread a top-drilled crystal prism to the center of each line. Double the lines and tie one to the top wire section of each butterfly wing. When you hang the butterfly, the crystals will dangle. Create beaded veins for the garden butterfly by threading beads onto strips of 22-gauge copper wire and attaching the wire ends to different points on the butterfly wings.